Tested for 10 minutes in a "good" environment, no eyestrain. (No PWM detected from "reading light" but even on minimum brightness the backlight stays partially on. I noticed in standby with the ads the backlight stays completely off so it may be possible to modify the software to add a backlight on/off function. So I think I may be getting the new Paperwhite for myself soon. Also my cousin had the new Moto X (don't know which model but it was running lollipop ) and despite being an AMOLED based screen I was unable to detect PWM with hand waving test as well. Something to look into perhaps? 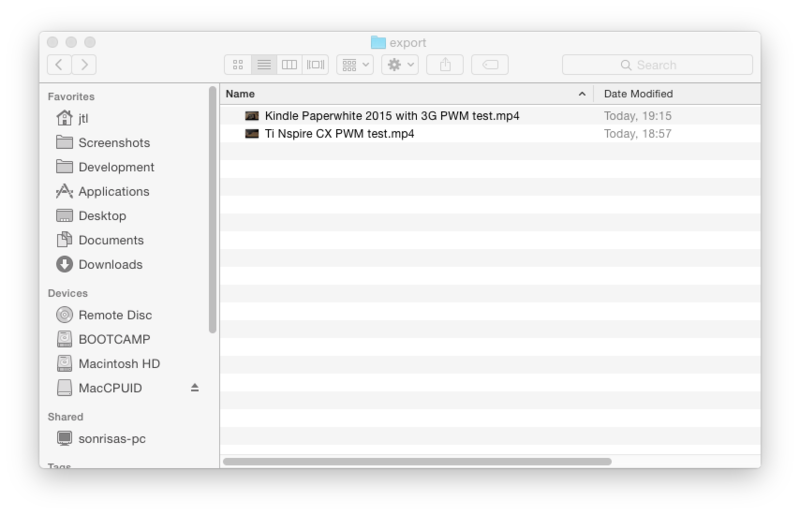 Ordered 2015 Kindle Paperwhite with 3G today 😃 We'll see. Great stuff JTL - keep us all posted. Would like to use a new device. I have to use a second hand MacBook from circa 2008. Replaced the hard drive recently to keep it going but this thing will eventually reach a point of obsolescence. The Lion OS is already way behind and I guess might not be supported in the near future if Apple decide to get rid to force us all onto something more modern. Out of interest, are you affected by LED bulbs used to replace incandescents for illumination of buildings or just LED backlit devices? I have a 2015 Macbook Pro with AMD graphics and a BenQ monitor. Also might find my old Dell CCFL monitor (was one of the first IPS panels) from storage and repair the dying backlight for fun.